Natures Aid L-Lysine (Free Form) contains L-Lysine Hydrochloride. 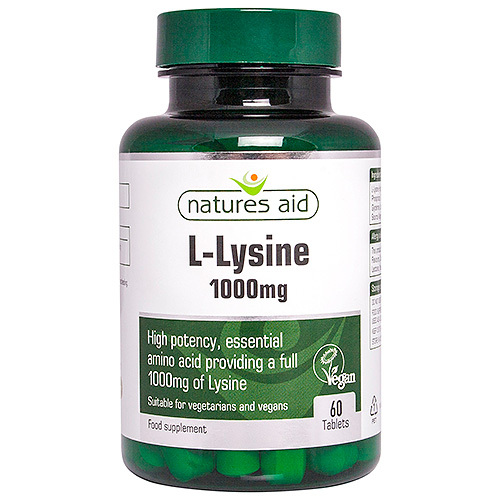 L-Lysine is an essential amino acid and is a necessary building block for all protein in the body. L-Lysine Hydrochloride, Microcrystalline Cellulose, Di-Calcium Phosphate, Tablet Coating (hypromellose, Glycerine, Lecithin, Dextrose), Anticaking Agents (Vegetable Source Magnesium Stearate, Silicon Dioxide). Below are reviews of Natures Aid L-Lysine (Free Form) - 60 x 1000mg Tablets by bodykind customers. If you have tried this product we'd love to hear what you think so please leave a review. Value for money good product to help avoid cold sores.